Welcome to the South Western Sydney Clinical School. The School is based in the fastest growing and most clinically diverse part of Sydney. Because of this the School provides an opportunity to learn in some of Sydney’s newest clinical and learning environments and with some of the most interesting clinical material that you will encounter as part of your training. There are a number of ways that the School will communicate with you. You must make sure that you have access to your official UNSW email. The Clinical School utilises the standard zMail address provided to each student (ie z1234567@student.unsw.edu.au) to contact students. You can manage the destination of your UNSW email address at http://idm.unsw.edu.au/ to ensure you receive these emails. We may also ask you for mobile details so that we can send you last minute SMS updates. The School will send students a weekly email newsletter throughout the year with latest updates. Ensure you consult eMed for the details of your weekly venue allocations. Last minute changes may be communicated by email directly to groups. Students also need to be aware that patient care is the priority at the clinical sites and last minute changes or cancellations may be unavoidable. Such cancellations will not disadvantage students and the time should be used to see patients as a group without your tutor or with junior medical staff on the ward. Students will fail any UNSW course if they do not attend 80% of activities. Attendance at tutorials is compulsory. Rolls will be called each week and students must attend a minimum of 80% to pass the course. If you are unable to attend on a particular day you should contact the Phase 1 coordinator at your site (see the Hospital specific pages at the end of this guide). Patients are the key to your experience while on clinical terms. They give their time generously and we need to treat them with respect and confidentiality about their condition and care. Consideration of the patient must be observed at all times. They may not be prepared to see students due to tiredness or other reasons. Students are able to meet with patients to practice your communication, history taking and physical examination skills independently and outside of the allocated teaching time. Students should only see patients at their allocated Hospital. Contacting patients at any other Hospital will be a breach of the law and can have serious consequences. Students must always introduce themselves and obtain permission to interview a patient from a senior nurse on the ward as well as seeking consent from the patient. Students need to have a certain level of communication capability before they interview patients completely independently. You should ask your tutor if they think you are ready to do this in your own time without supervision. Year 1 students might want to see patients along with Year 2 colleagues for support and advice. If students want to see patients for a designated assignment or project, they should discuss this with the Phase Coordinator before proceeding. 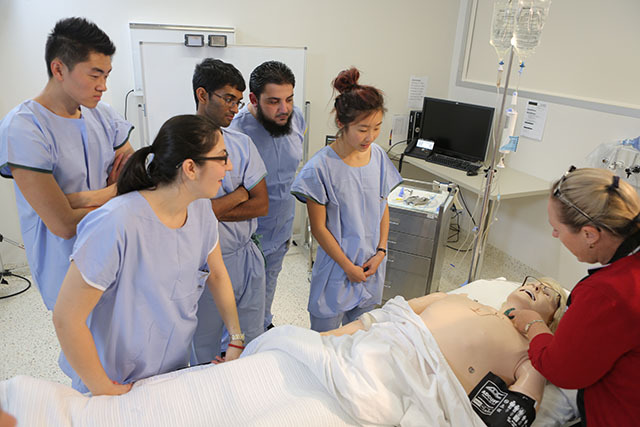 In line with UNSW policy all students must report to the Clinical School if they sustain any injury during the time they spend in the hospital. Examples of incidents include needle stick injuries, slips/trips/falls, chemical exposure or manual handling injuries. Students should immediately report to the Clinical School WHS Coordinator on the day of the incident so that any follow up actions can be taken. Students will only be allowed onto wards after they are fully verified under NSW Health’s ClinConnect program. If you have not completed this process prior to your term you will not be able to commence clinical activities. The Clinical School (+61 2 8738 3844) can provide information on the new South Western Sydney Local Health District verification clinic for those who are yet to complete this process. Students are required to wear name badges at all times at the Hospital sites. ID will only be issued after students are fully verified on ClinConnect and students must produce 100 points of ID in order to have ID issued. Students must complete a form to request ID and this must be authorised by the Clinical School at Orientation. Students must protect the confidentiality of patients they come into contact with. It is important that students do not openly discuss particular patients in public areas/corridors where private information may be overheard by others. Students must not remove any documentation relating to patients from the Hospital in either electronic or hard copy. Patient files must be returned to the designated place for safe keeping and it is important that other clinical staff have access to files which may be important in the ongoing care of the patient. Health care associated infections (HCAI) are a major and growing issue in the quality and safety of health care. A range of resources on hand hygiene that students should review prior to attending hospital are available from Hand Hygiene Australia. Uniwide (SSID uniwide) is available in a large number of locations across the South Western Sydney hospitals and students can login on their phones and mobile computing devices using your standard student ID and zPass combination utilised on campus. Common rooms and libraries at each of the Hospitals have computers provided by UNSW. Some computers are on the UNSW network and can be accessed using your standard UNSW credentials, while others on the SWSLHD network require students to login using username: medstudent and password: medstudent. Your UNSW credentials will then be needed to access the internet. Library staff will be able to assist if you have difficulties.